2018 marks the tenth anniversary visit of the Sinfonia of Birmingham to St Andrew’s Church, Barnt Green (B45 8NR). The concert, on Sat June 30 at 7.30pm, will feature the orchestra’s eight cellists performing Bachianas Brazileiras no 1. The programme will also include Beethoven’s 7th Symphony and Dvorak’s Czech Suite. 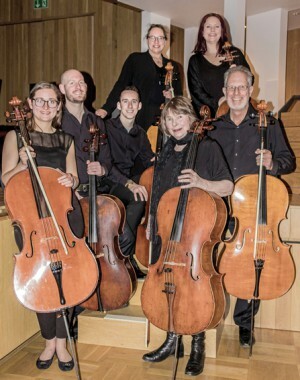 The Sinfonia, a leading chamber orchestra in the West Midlands, was introduced to St Andrew’s Church by Sue Peters in 2008, and proved to be a very popular event. Sue, a former chair, secretary and bassoonist with Sinfonia, worked tirelessly for the orchestra during her life, in addition to her other talents as a recorder player and oboist. Featuring as part of Bromsgrove Festival, the orchestra welcomes Richard Laing as conductor. Well-known in Alvechurch and Barnt Green for his long association with the Midland Sinfonia, Richard was a former student of the Royal Birmingham Conservatoire. He is now Principal Guest Conductor of the Birmingham Philharmonic Orchestra, Associate conductor of Malvern’s Chandos Symphony Orchestra and Music Director of orchestras in Inkberrow, Leicester, Leamington, Nottingham and Cambridge. Tickets are available on 0121 447 7671, 0121 445 4696, Artrix 01527 577330 or on the door. Admission £10, Seniors £8, other concessions £6, under 12s free.